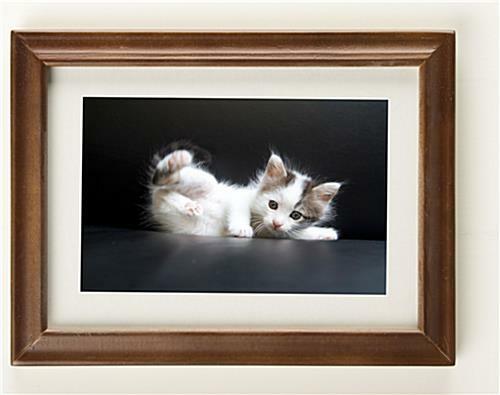 Wooden picture frames come with a removable mat to accent prints. Mat creates 3-1/2" x 5-1/2" viewable area for photos up to 5" x 7". 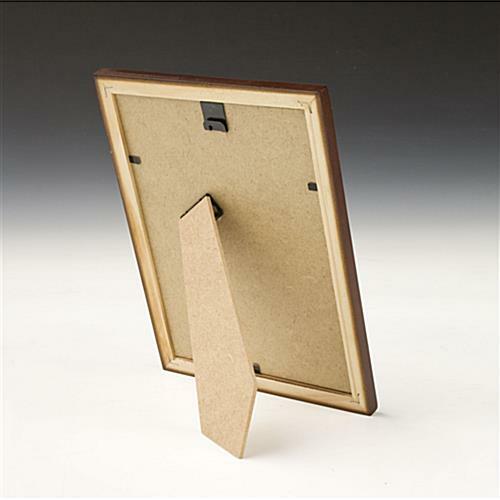 Easel backer for showcasing prints on a table in landscape or portrait orientation. 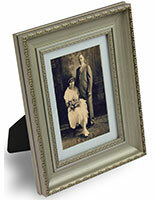 These wooden picture frames are very affordable, yet maintain the classic styling of more expensive photo framing. The molding of this unit is manufactured from authentic wood. 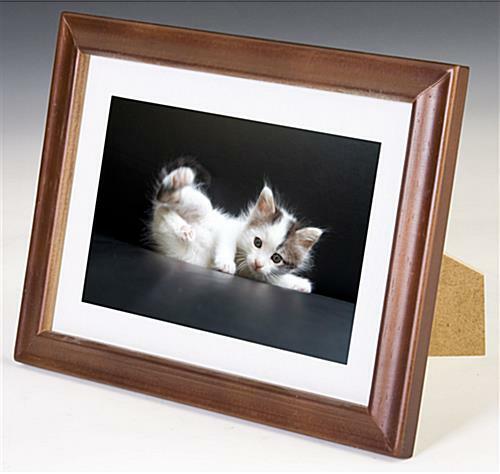 A glass lens is included with these wooden picture frames to provide a protective layer over prints. The molding measures 3/4" wide to create a decorative effect, yet is only 1/2" thick to ensure the display maintains a sleek style. 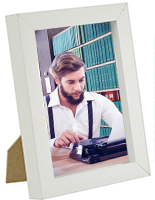 These wooden picture frames, called photo holders, come with removable accent matting. Further enhancing prints, the mat creates an additional 1/2" wide white border around photos. 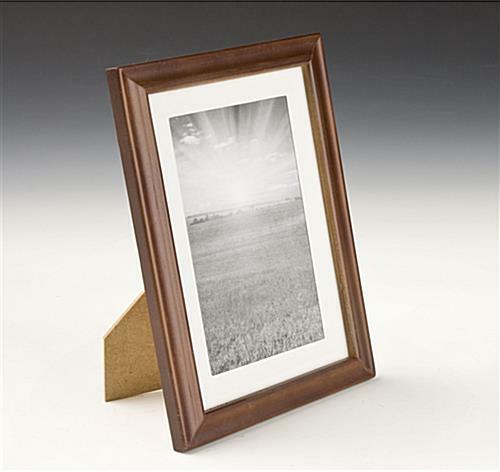 These dark brown picture frames hold prints ranging in size from 4" x 6" to 5" x 7". 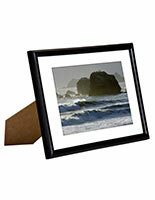 Photos with dimensions smaller than 5" x 7" need to be taped to the matting in order to say positioned. 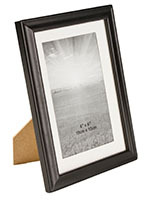 Your 5" x 7" prints will fit perfectly into this picture holder. 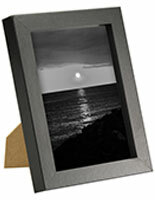 The wooden picture frames can hold 5" x 7" photos without the matting, creating a viewable area of 4-5/8" x 6-5/8". 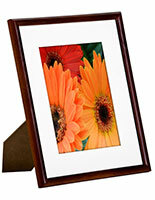 These wooden picture frames hang in landscape or portrait format. The easel backer provides a means of displaying this unit on a tabletop, in portrait or landscape orientation as well. 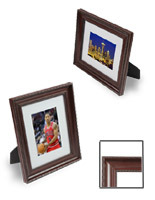 Metal retainer clips secure the glass pane, white accent mat, your photo, and the backer within the wood frame. This display coordinates with decorative or traditional decors. The brown finish creates a distinguished style that enhances any setting. This wood frame is a fraction of the cost of metal units, and even most comparative plastic models. 32.0" x 8.0" x 0.5"